The above, with other findings describing the benefits of early cART, raise the question of whether even earlier cART initiation - immediately after birth or during the neonatal period -could further reduce morbidity and mortality rates, and confer greater benefits, particularly for infants who acquired HIV infection during the pregnancy and are consequently at highest risk of rapid disease progression.3,4,5,6,7 The potential of early neonatal cART initiation in modifying the longer-term trajectory of HIV infection in an individual patient and need for lifelong cART is an area of intensive research. The recent shift to targeted HIV polymerase chain reaction (PCR) testing at birth rather than only at 6 weeks of age allows for the earliest detection of neonates in whom intrauterine transmission of HIV infection has occurred and has opened the door to neonatal cART initiation. Availability of validated point-of-care HIV PCR testing will further increase the drive to initiate cART during the early neonatal period. Safety and efficacy data on neonatal cART is currently very limited. There is even less experience with treating premature and low birth weight neonates with cART. Uncertainties relate to pharmacokinetics (PK), dosing, safety and choice of cART regimen. In addition, timing of the transition from prophylactic antiretroviral (ARV) regimens aimed at prevention of transmission to cART regimens aimed at long-term treatment requires further investigation. 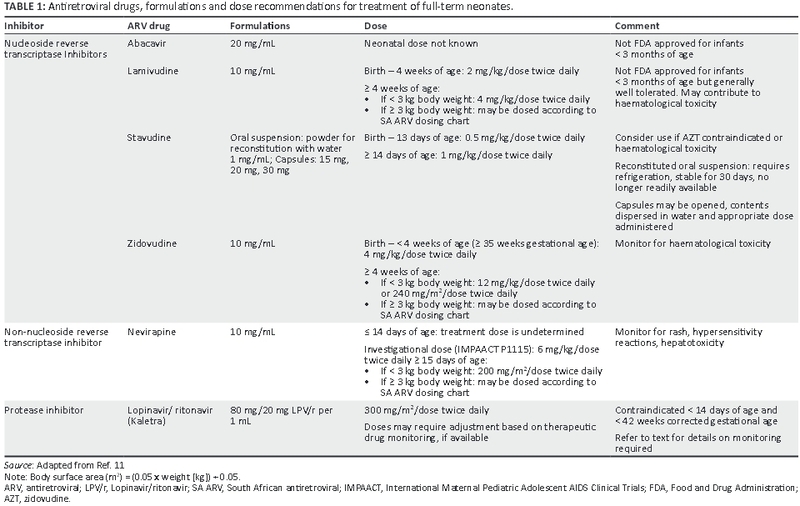 The SA ARV drug dosing chart (2013) recommends a Lamivudine (3TC) dose of 2 mL (20 mg) twice daily from 3 kg - 4.9 kg but advises expert consultation for neonates and infants weighing < 3 kg.10 Although 3TC is not Food and Drug Administration (FDA) approved for use in infants < 3 months of age, it has been used and studied in neonates. The recommended dose for neonates (< 4 weeks of age) for either prevention of transmission or treatment is 2 mg/kg/dose twice daily. The recommended paediatric dose (age > 4 weeks) is 4 mg/kg/dose twice daily to a maximum dose of 150 mg twice daily.11 These recommendations are based on population PK analyses in infants < 6 weeks of age.12,13 The higher WHO dosage recommendations (3 mL [30 mg] twice daily from 3 kg - 4.9 kg) result in increased plasma concentrations compared with the 2 mg/kg/dose recommendations and should be avoided in neonates.14,15 There are no published data to guide dosing in premature neonates. The recommended dose for neonates from birth to 13 days of age is 0.5 mg/kg/dose twice daily and, from 14 days onwards, 1 mg/kg/dose twice daily to a maximum of 30 mg twice daily.11,17 Dose reduction is recommended if there is renal dysfunction. There are no published data to guide Stavudine (D4T) dosing in premature neonates. Although there is limited experience in the context of neonatal cART, D4T in older infants and children generally has minimal short-term toxicity and good efficacy.11 It may therefore be a consideration for short-term use in neonatal cART when AZT is contraindicated or haematological toxicity has occurred. Alternative options for substitution of AZT are limited owing to lack of ABC safety and dosing information in infants < 3 months of age. An intravenous (IV) AZT formulation is available. It is generally used in the setting of prevention of transmission when the neonate is unable to tolerate oral medication.11 As no other IV ARV formulations are available, a fully IV treatment regimen is not feasible. Monotherapy with IV AZT as treatment in HIV-infected neonates is not recommended. In January 2011, the FDA released a statement on Kaletra toxicity in neonates.24 Post-marketing cases of toxicity were reported to the FDA's Adverse Event Reporting System (AERS) in September 2010 and were attributable to LPV and/or the inactive ingredients propylene glycol and ethanol. Kaletra oral solution contains 152.7 mg/mL of propylene glycol (15.3% w/v) and has a high ethanol content (356 mg/mL or 42.4% v/v). The IMPAACT P1066 study investigated the use of RAL oral suspension in combination with an optimised background ARV regimen in 26 HIV-infected infants and young children aged 4 weeks to 2 years who had previously received ARV medication for prevention of perinatal transmission. Clinical outcomes were acceptable, there were no treatment discontinuations owing to adverse events, and PK parameters were similar to those achieved amongst cohorts of older children in the same study.33 Raltegravir oral suspension is currently approved by the FDA for use in infants > 4 weeks of age and > 3 kg body weight.11 In SA, RAL suspension is not currently registered by the Medicines Control Council. In the SA public sector, RAL has been restricted for use in third-line ART regimens. Current SA HIV treatment guidelines recommend ABC+3TC+LPV/r as first-line cART for all HIV-infected children < 3 years of age; there are no separate recommendations for full-term or premature neonates.8 There are currently no published clinical trial data comparing different cART regimens initiated during the neonatal period. Clinical trials in older infants and young children have informed treatment recommendations in these age groups and are important to consider in relation to cART initiation during the neonatal period. Other studies have investigated whether 4 rather than 3 ARV drugs could improve outcomes based on the observation that young infants commonly have very high HIV viral loads and the hypothesis that increased regimen potency might achieve more rapid virological suppression, immunological recovery and better long-term treatment efficacy. However, the available studies are heterogeneous in nature and therefore difficult to compare directly, and 3 drug regimens have remained the standard-of-care in most guidelines. Further clinical trials comparing safety, tolerability and efficacy of different cART regimens, including consideration of 4-drug and triple class regimens, initiated during the neonatal period in high burden settings are warranted in order to better guide treatment recommendations. Neonatal ARV prophylaxis regimens vary between guidelines. 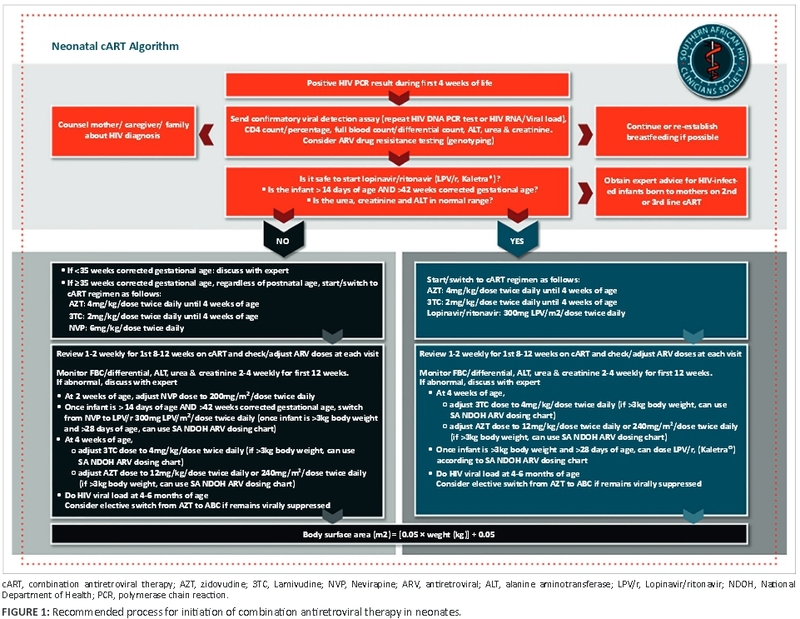 In SA, prophylaxis regimens include NVP alone, AZT alone, NVP + AZT, and NVP + AZT + 3TC, and recommended duration ranges from 6 weeks to 3 months or more.8,43 As a result, most neonates will be receiving ARV prophylaxis at the time that a positive birth HIV PCR test result is obtained. Transition from neonatal ARV prophylaxis to neonatal cART requires adjustment to the number and choice of ARVs, dosage and dose frequency in most cases. Clinical assessment of the neonate, baseline investigations and careful counselling of the mother and family are pre-requisites to cART initiation. Although optimal strategies for transition from prophylaxis to cART have not been widely studied, it is recommended that a standardised approach applicable to the majority of HIV-infected neonates is adopted (Figure 1). Expert opinion and individualised guidance will still be required for certain categories of neonates; for example, low birth weight, premature or unwell neonates. • A blood sample for confirmatory viral detection assay (second HIV DNA PCR test as per current National Department of Health [NDOH] SA guidelines or HIV RNA/viral load) must be submitted to the laboratory.8,43 Initiation of cART should not be delayed on the basis that the result of the confirmatory PCR test has not yet been obtained. Rapid and systematic follow-up of birth HIV PCR tests that might have been submitted to the laboratory by the birthing facility or a referring clinic or hospital, and recall of HIV-positive neonates, is essential. • The clinical condition of the neonate must be assessed. This includes determining the corrected gestational age (in weeks), postnatal age, birth weight and current weight, presence of any vital organ dysfunction including neonatal jaundice, hepatitis or renal dysfunction, and presence of other congenital or acquired infections including syphilis, tuberculosis (TB) and cytomegalovirus as indicated by the maternal history and clinical state of the neonate. Co-morbidities and their treatment may alter the timing of cART initiation and the treatment regimen required in the neonate. In neonates who are clinically unstable at the time that HIV infection is diagnosed, ARV prophylaxis should be discontinued and the neonate stabilised and treated as necessary prior to initiation of cART. In addition, neonates who are not fully established on enteral feeding are not eligible to initiate cART. ■ HIV-infected neonates who are also exposed to and/ or infected with TB require evaluation as to the infectiousness and drug sensitivity profile of the contact, and assessment (clinical, radiological, bacteriological) of TB infection/disease followed by anti-TB chemoprophylaxis or treatment. HIV-infected neonates initiated on rifampicin and receiving LPV/ r-based cART will require additional RTV (0.75 x LPV dose) to be added to the cART regimen although PK, safety and efficacy data for the super-boosting strategy in the neonatal age group is lacking. The PK, safety and efficacy of rifampicin in combination with NVP-based cART in the neonatal age group is also not known. Expert advice should be obtained. • Baseline blood investigations should be performed including full blood count and differential white cell count, urea and creatinine, and alanine aminotransferase (ALT). • Careful and detailed counselling of the mother and if possible other family members who will be involved in the care of the neonate is required. The mother of the child might not have disclosed her own HIV status to other family members, and disclosure of the neonate's HIV status to the family should be discussed. In addition to providing support, counselling should include information about the HIV diagnosis in the neonate as well as details about cART. Information and guidance on infant feeding should be provided. Mothers who had chosen to breastfeed should be encouraged to continue breastfeeding whilst mothers who had chosen formula feeding should consider switching to breastfeeding if feasible. • Ideally, a blood sample should be submitted for ARV drug resistance testing (genotyping) prior to initiation of cART in the neonate. This is particularly relevant when the neonate has been exposed to maternal cART or ARV prophylaxis prior to the diagnosis of HIV infection, and may assist in determining optimal ARV drug choices in future cART regimens for the child. Expert advice should be obtained to assist in the management of HIV-infected neonates born to mothers on 2nd- or 3rd-line cART regimens. In neonates > 15 days of age and > 42 weeks corrected gestational age and with normal renal and hepatic function, an initial regimen of AZT+3TC+LPV/r is recommended. Refer to Table 1 and Figure 1 for guidance on dosing and monitoring. In full-term neonates < 14 days of age, approved dosing recommendations are only available for AZT and 3TC. Treatment with only 2 drugs is not recommended. Based on a detailed review of available PK data, an NVP dose of 6 mg/ kg/dose twice daily in full-term neonates initiating cART < 48 hours of age is under investigation in the IMPAACT P1115 study. Pending the results of this and other studies, a provisional recommendation to use an initial regimen of AZT+3TC+NVP dosed twice daily in neonates > 35 weeks gestational age at birth, regardless of postnatal age, with normal hepatic function and appropriate monitoring for toxicity seems reasonable. Refer to Table 1 and Figure 1 for guidance on dosing and monitoring. As there are data for older infants and young children showing superior efficacy of LPV/r-based, compared with NNRTI-based, cART, these neonates should be considered for elective switch to AZT+3TC+LPV/r when they are > 15 days of age and > 42 weeks corrected gestational age. The decision to initiate cART in premature neonates < 35 weeks gestational age involves assessing the relative risks and benefits of using unapproved dosing and the inherent concerns regarding drug toxicity. 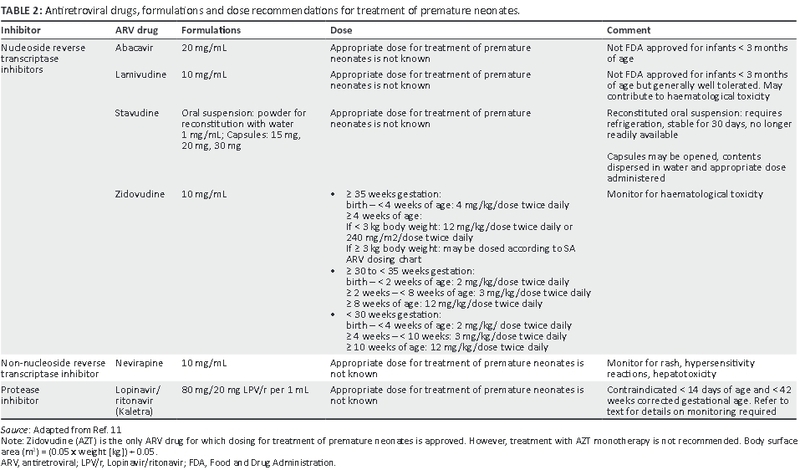 Dosing recommendations for premature neonates are currently only available for AZT. Treatment with AZT alone is not recommended and, based on currently available data, it is recommended that Kaletra should be avoided in this age group (refer to Table 2). If cART is initiated in premature neonates, expert guidance on dosing and toxicity monitoring should be obtained.